Here is yesterdays dinner: Meatza. 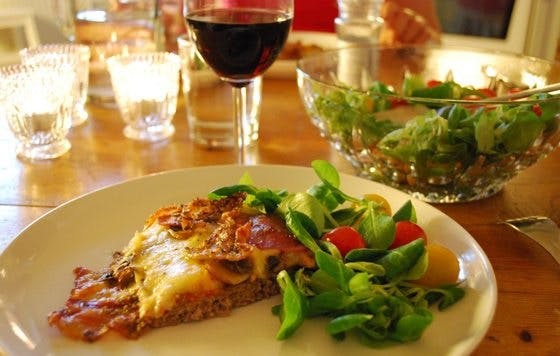 It’s LCHF pizza with minced meat as the bottom. Not bad at all, and after just two pieces I was completely full. That never happened when I ate flour pizza. Eating this delicious meatza I missed nothing, and I suspect any kids in the family would feel the same way. What the Cornell-Oxford crew did was they collected the data and wrote papers based on it. Thanks to researcher's transparency we have the data available for all the people in the world with online connection. For you to claim that there's no avenues for journal-level critique is grotesque. That is a lie. Even I can use the data and write a paper about it, if it is good enough, a journall will publish it. I repeat there's no scientific critique against the China Study. That's not how the Weston Price Foundation - crew rolls. They don't contribute to the scientific debate. They write blogs. Perhaps the lack of any critique tells something about the initial study. After all its thoroughly checked by the best statistician Oxford could afford. @Jon : "Sure 30bananas a day is a vegan site, pay attention to the substance, not on your ideology, or ideology of any others." There is nothing in those links that refutes Minger's analysis of the China Study. And the professional cancer epidemiologist has a curious view of the purpose of epidemiological studies. They are NOT a good tool for informing the public! They are a good tool for locating patterns that can then be tested more carefully in order to find actual causes and not just correlations. If research is able to isolate one or more causes, THEN is a good time to inform the public. I find it odd that you tell me to "pay attention to substance" when I point out that 30 BAD is a vegan site, but in the very same post you try to dismiss Minger's work by linking her to the Weston Price Foundation, and you state that you won't "take me seriously" unless I provide a critique that has been peer-reviewed. There appears to be a cut-off point for paying attention to substance. If Minger's critique really had been debunked, no one would care that she was associated with a group or not. There remains no evidence that the WPF paid her to write her critique or that it provided her with assistance. And thus there should be no issue with her being invited to speak at a forum hosted by a the WPF. That is irrelevant since you "pay attention to substance, not ideology" right? Since they promote the cause of small farms that prefer to raise free-range and grass-fed livestock, they're not particularly loved by the meat and dairy associations and their funding reflects this. To compare them ($1.2 million in gross revenues in 2009) with the agri-business giants, who enjoy literally billions of dollars in government subsidies every year (and combined sales of almost $200 billion annually), is a bit comical. @Jon : "[Harriet Hall's]critique in the form of putting links to amazon-discussion pages and linking her opinion to Weston-Price Foundations propaganda was cute." Pub Med ID 19166134 "Vegetarian diets, chronic diseases and longevity." "In fact the most healthy people in Europe are inhabitants of Iceland, Switzerland and Scandinavia, consuming great amounts of food of animal origin. Meta-analysis of several prospective studies showed no significant differences in the mortality caused by colorectal, stomach, lung, prostate or breast cancers and stroke between vegetarians and "health-conscious" nonvegetarians." PMID 16441942 "Health effects of vegetarian and vegan diets." "Cohort studies of vegetarians have shown a moderate reduction in mortality from IHD but little difference in other major causes of death or all-cause mortality in comparison with health-conscious non-vegetarians from the same population. Studies of cancer have not shown clear differences in cancer rates between vegetarians and non-vegetarians." PMID 10479225 "Mortality in vegetarians and nonvegetarians: detailed findings from a collaborative analysis of 5 prospective studies." "There were no significant differences between vegetarians and nonvegetarians in mortality from cerebrovascular disease, stomach cancer, colorectal cancer, lung cancer, breast cancer, prostate cancer, or all other causes combined." She also showed how at least three of Campbell's references were either inconclusive, did not show what he claimed it did, or was from a report that was already discredited. I don't think that she has been debunked at all. Much like the attacks on Minger and Masterjohn, there is no attempt to deal with the SUBSTANCE. And as I've said before, the studies showing that vegetarian and vegan diets do not lower mortality or cancer risk versus diets that include meat disprove the whole idea of the toxicity of meat or meat protein. No matter how many studies purport to observe the opposite! If meat really was poisonous, if protein really did promote cancer, then the studies would be consistent and easily verifiable by removal of confounders via controlled testing... and this is not the case. @Jon : I don't think you understand what I am saying. You seem to want to cling to the idea of peer-review as some deciding factor, even though it does not apply here (from both a practical perspective and from one that values substance over ideology). My point is simple: it does not matter how many peer-reviewed articles based on China Project data exist. THE BOOK (The China Study by T. Colin Campbell) is not a peer-reviewed article. The data from the China Project itself is just that: data, and it is subject to interpretation, not peer review. He may reference peer-reviewed work (and he does so poorly, as I've documented several times already) but that does not make the book a peer-reviewed work. Therefore, CRITIQUES OF HIS BOOK are not a valid avenue for publishing as peer-reviewed work in industry journals, since his book doesn't meet that criteria. The fact that others have done research based on the data is irrelevant, and the claims that Minger should do her own research and disprove Campbell via the peer-review process are absurd; she is using the same method to critique his work as he used for presenting it. Campbell made claims; Minger is questioning the validity of those claims. The onus is on Campbell to defend his work, not on Minger to create a whole new work (how does that even make sense???). The demands that she submit to peer-review are nothing more than an attempt to dismiss her findings without having to actually defend the work in question. You speak of valuing substance over ideology, but it seems as if you only apply that ideal when it suits you. once again Minger is not criticizing a book she hasn't even read. The book has 18 chapters which one is about Cornell-Oxford study. What they are criticizing is that Campbell hasn't allegedly aknowledged this or that factor in the data. I want this to be published. Her finding on data might worth for cancer epimologist. Well, not in this world :) You have not even idea what these are doing, you just keep talking about a book that not a single person in the LCHF-fora has ever even read. I posted you a study on vegans which was published a week or two ago. However, I would be naive to assume that vegs in Western World would be significantly better off from the mainstream. What the heck, any vegan can drink coke and lie on the sofa all day, drench their meals in olive oil, etc, eat refined sugars, smoke bong and eat mushrooms, etc. Campbell refers these folk as "junk-food vegeterians". Anwyays, reading a very informative debate between Cordain and Campbell. Little off topic, but worth to know for Doc. Colin come up with some form of critisism towards to RCT's. "The randomized clinical trial (RCT) is NOT the “trump card” of all diet and health studies, as claimed. RCTs were meant for the testing of pharmaceutical agents and would-be pharmaceuticals called neutriceuticals (i.e., nutrients), not for assessing lifestyle nutrition. RCTs have undoubtedly distorted the concept of nutrition and caused more confusion in diet and health research than almost any other scientific endeavor in recent years". Good work, Milton. My respect. I could also add the a professional cancer epimologist has very much advocated along with Colin T Campbell that Minger ought to report her "findings" (an obvious irony) to a scientific platform. It's only you that is militantly against this idea. I could also add that the vegs used these studies Milton provided, out of them 90% used dairy products. Accoring to Campbell, these kind of lacto-ovo vegeterians indeed do not receive much of health benefits compared to mainsream. Milk is liquid meat. I could also personally state that why I myself believe that low-fat plant-based diet is the best is because the physicians using this kind of diet have reached fantastic results while treating their patients. Low-fat, plant-based diet is the only diet that has reversed heart disease, among other things. That's very dramatic in medical history In the treatment of many autoimmune diseases the results are equilly staggering. It also puts people off the diabetes medication. I have never read in medical literature that diseases have been conquered and cured with LCHF. Even all the weight loss achieved this way includes severe calcium inbalances, urinating the calcium among other things. That's not true healing, that's compromising, changing a symptom to another. @Jon : Yes, most critics of the book have focused on the relatively small portion that draws data from the China poject. The reason is that it's the most easily verified portion of the book (the data is available and a direct comparison can be performed). Since Campbell uses the data to back his claims regarding the dangers of meat and protein, the credibility of the book as a whole depends greatly on how he interprets the data. If he did a poor job of it (and he did) then it casts doubt over the rest of the book. That is why a specific and comprehensive response would have bolstered his credibility, and why his actual response (mostly bluster and diversion) undermine it. He cannot simply question her credentials and brush her off; her work is too strong for that. But that is what he did, and that is why her critique remains relevant. @: I have no issue if Minger decides to write an article on the China project data and submits it for peer-review. I just don't see where her lack of such has any effect at all on the *substance* of her critique of Campbell's book. @: I do not believe in a one-size fits all diet. Nearly every diet expert/guru agrees that people should reduce or eliminate refined sugar. Most will also advocate a reduction or elimination of refined carbs, particularly white flour. Many advocate a reduction or elimination of wheat and grains, and at least a reduction in starchy foods and vegetable oils. I consider that to be the starting point. From there it is simply a point to make sure you get the necessary nutrients you need in a form and balance that keeps you healthy. Thanks to supplementation, we have a wide variety of options for healthy eating. That doesn't mean that every diet will work, but I think that most will as long as a person makes the effort to find what works and what doesn't. As for research, I've found that when it comes to overall mortality, studies indicate that a healthy diet (that avoids the foods mentioned above) will work well no matter the approach. Most research, when you look past the bias of the writer and check his data, points the finger at sugar, vegetable oils, and grains (especially wheat). When these factors, and others like smoking and exercise, are accounted for, meat and fat fare no worse than fruits and vegetables. One diet may decrease your risk of heart disease, but increase your risk of cancer. Many researchers have, since the days of Ancel Keys, performed work that is at best shoddy and at worst criminal. They have set back the science of health and diets by at least a half-century, maybe more. I am hopeful that we'll put an end to this kind of practice before I'm an old man, but there is a lot of money and politics involved, and those are very powerful influences. Milton. The data is over 900 pages long, its NOT available in the book, which I can easily verify since I have the book on my lap. Let go, you have no clue. You do not have the slightest idea what is being discussed or critisized. There is a small portion of The China Study (the book, not the monograph. You yourself noted it was one chapter of 18) that draws conclusions from the data in the China project. The China project is a monograph that is available at many libraries, particularly at colleges. There is a second set of data, produced in 1989, that is available online. Therefore, because the data is available and the book devotes a small but critical portion to it, it is easiest to focus on that. @Jon, # 105, "The randomized clinical trial (RCT) is NOT the “trump card” of all diet and health studies, as claimed. RCTs were meant for the testing of pharmaceutical agents and would-be pharmaceuticals called neutriceuticals (i.e., nutrients), not for assessing lifestyle nutrition. RCTs have undoubtedly distorted the concept of nutrition and caused more confusion in diet and health research than almost any other scientific endeavor in recent years". That's just rubbish and spoken like someone who knows that his position is untenable if subjected to the rigorous scientific standards of RCT and doesn't want to admit it. Undoubtedly, RCT are difficult and expensive to design when it comes to nutrition and life style, but that doesn't mean we shouldn't try or that they aren't the best way to generate meaningful data. If RCT have, indeed, "distorted the concept of nutrition and caused more confusion in diet and health research", it is because the data so generated has been deliberately misinterpreted or manipulated to suit the researchers' biases. And then I understood her comments. And it's really very funny, because it means that her "debunking" of Minger consists of AGREEING WITH MINGER'S PRIMARY POINT. It's hilarious. She chastises Minger for using an over-simplified analysis... which was Minger's point about Campbell. She says it is "irresponsible" for Minger to draw conclusions based on such a superficial analysis... which was Minger's point about Campbell! Then she goes through a simple Q&A where she admits that she has "not checked [Minger's] math, and I don't possess the qualifications necessary to evaluate her work the way an expert in the field could." Then she states that she feels that the lack of peer-review is a legitimate reason to dismiss Minger's work. Like Jon, she confuses Campbell's book (which Minger was critiquing) with the China project data (which Minger was NOT critiquing) in order to support her call for peer-review. She does admit that "scientists are NOT objective (I'll say it: I'm an ardent veggie with a happy veggie family). Hell, science is not objective. I mean, you could be given a blob of numbers that mean nothing. It takes some context, interpretation, and data processing to make anything meaningful out of those numbers. Yes, scientists can be biased, and so can the studies they conduct, and the analysis of those studies." I will agree with her on that. I think it explains why her critique of Minger reads more like a validation of Minger's work. That was a pretty amusing read. @Jon I have never posted on this site, but check it everyday. I am an avid reader, but also have time with other things in my life. As a believer in LCHF, I find discussions interesting, but facts moreso. I will not try to debate anything that is in any type of journal or any book, partly because I don't know a lot, but to a greater extent that I don't want to act like I do. The facts I will discuss instead are the facts I have seen on this site. Within the month of June, which is 16 days so far, you have posted 100 times. Not only that, you are posting on a site where readers clearly do not agree with your posts and have been working to expel any notion of you being remotely correct. You, however, have posted more than the next 4 top contributors combined. You have posted on average more than 6 posts a day, which is a post almost every 4 hours. Furthermore, with the information each person has been contributing to the argument, it would be next to impossible to research everyone's rebuttal prior to a response. With that said, I will not be rude and ask you to leave, however please take more care when contributing to a blog. I'm sure the doc does not enjoying reading that many posts from a single person to ensure that they are appropriate, and I am sure the other contributors would like you to consider carefully their counterarguments. I am looking forward to continuing my LCHF experience which in three weeks has significantly lowered my blood pressure below the prehypertension levels and has allowed my to drop 10 pounds. Thank you Doc for giving me the tools to start a change in my life. Back to the original post: Doc that meatza looks great. I am the primary cook in my household, so that one will be made in the near future. Any advice on preparation? apparently Denise Minger is going contrary to everything you say, and tries to get her work published in a peer-revieved work. So, just take it as I say, and spare your time and my time. Unlike you, I've done my homework. "Top Secret China-Study-Related Mystery Thing: I’d love to spill the beans on this one, but they’re not done soaking and I’d hate to flood you guys with lectins. So for now, I’ll just say that I’m working on a thing with a person, and the person and I have the goal of getting the thing published in a well-known other thing, and if all goes as planned, the published thing should help combat the “but the China Study re-analysis isn’t peer reviewed!” argument". EVERYTHING I say? LOL she must be pretty busy these days, trying to go contrary to everything I say. Then again, if you look above you'll see my comment where I state "I have no issue if Minger decides to write an article on the China project data and submits it for peer-review." So I don't see how she is contradicting anything I said, much less everything.